This textbook deals with current theories of the management of people employed in schools and colleges, recent developments and emerging trends. 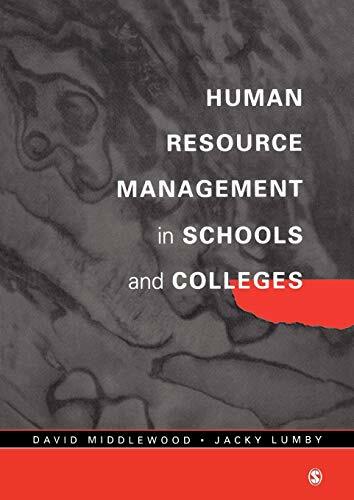 The authors focus on: issues relevant to the whole organization; the specifics of managing a school or college and its employees; and cover the application of good practice to management processes such as selection, induction, performance management, appraisal and staff development. David Middlewood is currently a part-time Research Fellow at the Centre for Educational Studies in the University of Warwick, having previously worked at the University of Lincoln and the University of Leicester where he was Deputy Director of the Centre for Educational Leadership and Management. Prior to working in Higher Education, David taught in schools for many years, culminating in the principalship of a comprehensive secondary school for nine years, where awards were won for creative arts and equal opportunities. He has taught and researched extensively in the UK and also in various countries in Europe and Africa, being a visiting professor in New Zealand and in South Africa. David has written and edited more than twenty books, many on people leadership and management, strategic leadership, appraisal, practitioner research and some recent research includes work on high performing teams, support staff and student voice. He was co-editor of two professional journals for both primary and secondary school leaders for over six years. He recently co-authored a book on the leadership of groups of schools and his current work (with Ian Abbott) concerns leadership of learning for disadvantaged pupils.